The Boyfriend pop star has made headlines in London during the past week for being late for his concert, falling ill during another show and losing his temper with a photographer. "There's nothing wrong with him. He's in a great place," Scooter told E! News. Scooter, who also manages Carly Rae Jepsen and Gangnam Style star Psy, admitted that Justin decided to cancel his Portugal show because of technical issues, regarding the time it would take to move the entire concert production from one location to another. "It has nothing to do with anything other than that. Tell everyone Justin is good, really good," he said. Justin was joined by his younger brother Jaxon as he performed his first show in Lisbon. "Me and @JaxonBieber - unstoppable! haha," he tweeted, adding: "PORTUGAL was RIGHT TONIGHT!! 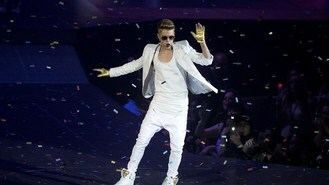 #SOLDOUT #BELIEVEtour. Thanks to all the fans...the beliebers tonight. Incredible show!" The 19-year-old superstar also tweeted his thanks to One Direction's Zayn Malik and Louis Tomlinson for their support, writing: "@zaynmalik @Louis_Tomlinson Thanks fellas. All good over here. Much appreciated." Louis previously posted: "I really do empathise with him, I don't see anything out of character in comparison to any other teenagers I know," while Zayn wrote: "What a dude man :D ha got your back bro !! @justinbieber."